Michael Augello: Carolina Hurricanes assistant GM Rick Dudley was listed again to attend a Maple Leafs game. It has been the fifth time in the past couple of weeks that Dudley was listed to watch a Maple Leafs home game. David Pagnotta: It may not be anything, but Anaheim Ducks GM Bob Murray was in the Toronto to watch the Maple Leafs-Golden Knights game last night. He watched the game in the stands. Ducks director of player development Rick Paterson was the only Ducks ‘scout’ listed to be in the press box. TSN: Darren Dreger was on TSN 1050 yesterday and was asked to update the Toronto Maple Leafs and William Nylander situation. “Status quo is what I get on a day-by-day basis,” Dreger told First Up on TSN Radio 1050 Toronto on Tuesday. Nylander has now missed the first 15 games of the season and as of last week, there was still a big gap. 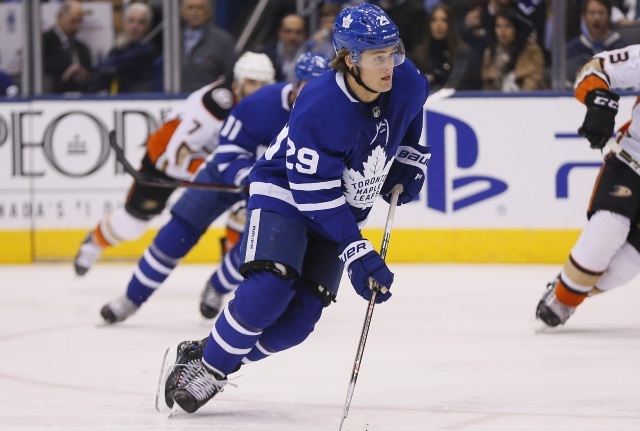 Last month Nylander’s camp may have been looking for more than $8 million, with the Leafs countering with an offer in the $6 million per season range. Michael Smith of NHL.com: Carolina Hurricanes goaltender Petr Mrazek is now listed as day-to-day. Scott Darling had just returned from his lower-body injury. The Hurricanes have been carrying three goaltenders – Curtis McElhinney being the other. GM Don Waddell said over the weekend that it’s a luxury that they can afford to do right now with their roster flexibility.